Armstrong walked on the moon, baby boomers rocked Woodstock, and Route 66, America’s Mother Road, resonated with the rumble of the Chevy Camaro. Designed to dethrone the Mustang, the 1969 Camaro could pack up to 396 cubic inches of power under its hood. Its aggressive, low profile stance gave the impression of a panther ready to pounce. Even today, the ‘69 Camaro turns heads at car shows, cruise nights and anywhere else a love for big-displacement, Detroit power endures. 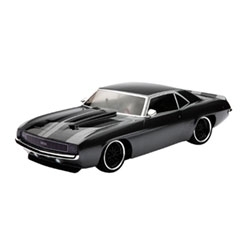 This stunning reproduction of the ’69 Chevrolet Camaro RS comes with a detailed body, low profile tires and large diameter wheels that perfectly capture the cool menace of this American muscle car classic. Lurking beneath this sleek exterior is the power and poise of a V100-S chassis. Its potent Dynamite® power system and shaft-driven 4WD deliver all the speed, traction and control you need to earn serious street cred right out of the box. -driven 4WD deliver all the speed, traction and control you need to earn serious street cred right out of the box. The V100-S chassis gives you a balanced, neutral handling car with a wide range of tuning options. It also features universal body mounts that are compatible with most other 1/10-scale bodies. The elegant aggression is present in every line and curve of the officially licensed body. Details include side view mirrors, chromed exhaust tips and clear headlights. Life on the street isn’t always dry and weather is often less than perfect. That’s why it's equipped with a waterproof receiver, speed control and steering servo so you can run in all kinds of conditions. *For complete details on waterproof standards, please refer to the product instruction manual. The shaft-driven 4WD delivers excellent traction on paved surfaces and superb drift control when sliding across loose surfaces. The differentials are sealed against the elements and can be tuned for a variety of running conditions. The low-profile tires and 54mm wheels, along with the detailed appearance of real brakes and calipers, look as good on display as they do on the move. The rear tires also have a little more meat than the fronts for better grip and a little more attitude.